Being a getaway rental host on a site like Airbnb could be a great way to increase your income and connect to the travellers from all around the globe. However, a getaway rental host tends to have a very high standard when it comes to quality of services. Especially when it comes to Airbnb cleaning. And this pressure is a product of the host’s aim to offer a quality stay of their guests in order to get a good review and feedback. According to Airbnb, cleanliness is one of the major standards that rental hosts are required to meet. Whilst for those hosts who are consistently receiving low cleanliness scores might be subjected to penalties. Yes, cleaning all corners in your getaway rental property in every guest booking could be mentally and physically challenging. Not to mention keeping it clean and tidy all the time is just only one part of your duties as a host. Fortunately, there are several ways to automate your Airbnb cleaning. And this will effectively take some stress on you. After all, it would be nice to relax and worry less while someone takes care of the cleanliness of your rental property. 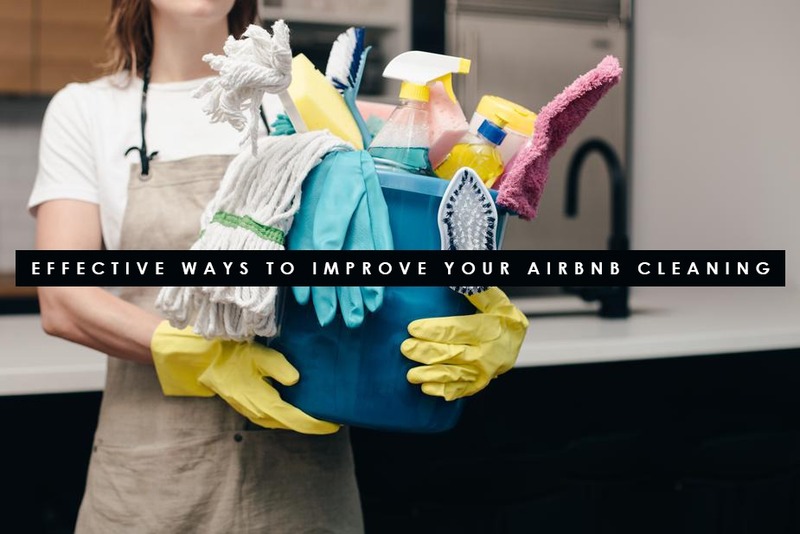 Here are the 5 effective ways to improve your Airbnb Cleaning. Most of the guests on Airbnb will expect to have the same standards of cleanliness as full-service hotels offer. Similarly, meeting these demanding standards could be a bit stressful. And you don’t have access to the same full-time housekeeping crews that most hotels do. However, you could hire a professional and reliable cleaning company to clean the property for you. Likewise, they could take care of the entire chore. And this professional service providers will make sure that your guests would feel comfortable during their stay at your place. Getting the property cleaned right after the guest leaves will keep your place look fresh and tidy. However, it is more important to schedule a deep cleaning service to your unit. Just bear in mind that it’s not necessary to do it all the time. You might have heard of spring cleaning service, right? Well, the same thing goes but do these kinds of clean at least twice a year. You could ask the Airbnb cleaning company you hired if they also provide a deep cleaning service in addition to the basic ones they offer. After all, it’s best to have the same company doing it all for you. In this way, you don’t have to adjust every time they change the cleaners. Also, the recent crews you hired are already familiar with your property as you are with them. Having enough stocks of toiletries and other supplies is important to ensure your guests’ satisfaction. Try to put your feet on their shoes, you don’t want to rent a room without supplies, right? So, having such useful amenities will help a lot for your positive reviews and ratings after their stay. It might be easy to slip up and forget to replace supplies like toilet papers and paper towels. But remember that a guest without toilet paper is not going to be happy. That is why it is worth to hire a professional cleaning company that will handle all these things. They could do a quick inspection of all your supplies. They will then notify you of anything that needs to be replenished before the next guest checks in. Dealing with any damages are something that most of the hosts have to deal with from time to time. And it’s just part of the job. Well, it’s never fun to always inspect and correct any damages. And if you miss the damage during your inspection you may allow the damage to spread and become worst. And if that happens, you would likely to receive a negative review from the future guest who was inconvenienced by the damage. Yes, there are numbers of ways for you to save your time and avoid stressful cleaning problems when it comes to managing your rental property and improving your strategies is one of them. Doing some research and finding the right company for your Airbnb cleaning and turnovers will surely give you a stress-free task. Are you looking for a reliable cleaning service? Maid in Perth is here to help you out. Call us today and learn more about our variety of cleaning services that may fit your needs. Also, don’t forget to visit our blog section for more useful insights about cleaning. Want to learn more? Visit our site for more insight.